Sittin' at Mickey D's in Quesnel, BC (pronounced Qwenell). 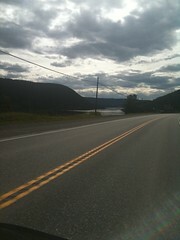 Williams Lake, BC was beautiful, but the small mountain town had no obvious place for Internet connectivity so I jumped back on the bike and kept going. 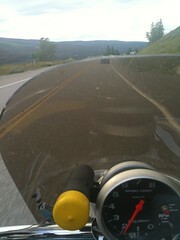 I made excellent time between there and Quesnel and most of it was downhill. I had not realized how high up I had traveled since Abbotsford. I managed to hook up with a white sports car and a black pickup who were both also into making good time and I was finally able to open her up abut and see what she could do. We maintained a blistering pace most of the way and the bike came through with winning colors! Despite the truck tire on the rear, it handled well in both the straightaways as well as the curves. (Don't tell anyone, but I was easily running 20 to 30 kph over posted for those curves.) And let me tell you about passing! Never, ever, NEVER, have I EVER ridden anything that gets up to speed so fast on the ground!!! 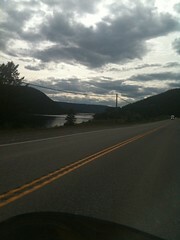 Quesnel is a small place with a lot to choose from. 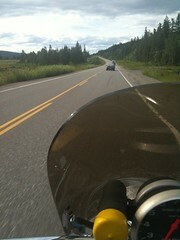 Amazingly enough, the weather is holding and I'm only about 75 miles from Prince George, my next stop. I'll decide then if I am done for the night or still ready to start the next leg.